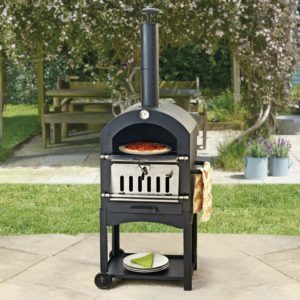 Stylish and compact, this Clifford James pizza oven is a modern take on traditional clay outdoor models, with the added bonus of being manoeuverable thanks to the two wheels and handles. 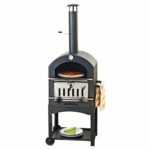 It is perfect for those who love the idea of preparing fresh pizzas but also love traditional barbecuing – this multi-function appliance can act as a charcoal barbecue as well as being compatible with pizza stones. As a bonus, there is one included with your purchase, so you can get going straight away without having to worry about which to buy to achieve the perfect crispy base. If you are worried about finding it hard to control and maintain the temperature, then this model can put all those worries to rest. The in-built temperature monitor is a clever feature which makes it easy to check, and the chimney has smart oxygen flow technology control which helps to maintain the perfect steady temperature at all times, without you having to change briquettes and decrease air flow. When the product is not in use, it can be wheeled out of the way or into storage. The flue simply screws onto the body of the oven, and this is then fitted to the stand with screws, so it can be dismantled and rebuilt as often as needed if you only use it every once in a while. There is a cover available to buy as an extra which will protect it from the elements if you wish to keep it outside. With an outer iron casting, it will remain in great condition no matter what is thrown at it. The removable ash tray helps to keep everything clean with ease. A storage shelf at the bottom of the oven will keep all of your condiments, plates and cutlery in one place until serving time. If all of that hasn’t persuaded you, there is a 24-month guarantee included, so you don’t have to worry about it suddenly going out of action within the first few months.